Samraoui, F., Alfarhan, A. H., & Samraoui, B. (2013). Status and breeding ecology of the Common Moorhen Gallinula chloropus in Algeria. Ostrich 84: 137-144. The status of the Common Moorhen Gallinula chloropus in Algeria and its breeding ecology in North Africa are reported for the first time. Nest site selection and breeding parameters were studied at two contrasting sites in north-east Algeria: Boussedra, an unprotected freshwater marsh of 55 ha subject to anthropogenic influence, during 2005 and 2008, and Lake Tonga, a protected freshwater marsh of 2 400 ha in 2009. Most nests (92%) at Boussedra were located in dense stands of lesser bulrush Typha angustifolia, whereas a few were found on lower branches of tamarisk Tamarix gallica trees. In contrast, at Lake Tonga nests were predominantly found on Scirpus lacustris (41%) or associated with alder trees Alnus glutinosa (32%). Egg-laying at both sites occurred between early April and the end of June. There was a significant decrease in egg volume as the breeding season progressed. Mean clutch size at Lake Tonga (7.8 ± 2.9, N = 23 clutches) did not differ significantly from that at Boussedra (6.7 ± 2.1, N = 14 clutches). Similarly, hatching success (67 –72%) and predation rate of nests with eggs (16–28%) did not vary significantly between sites. 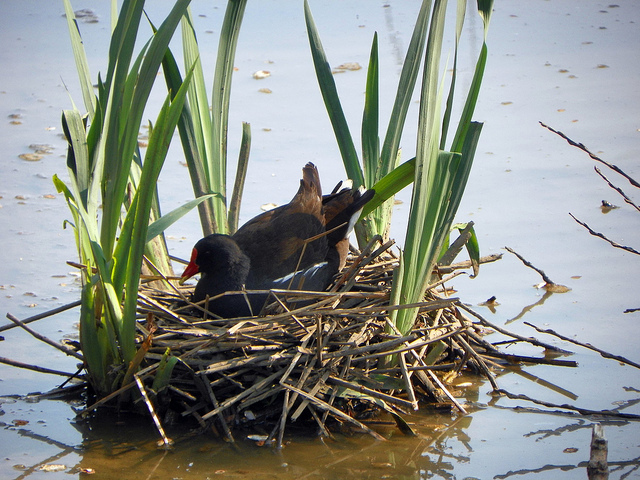 The Common Moorhen may be more resilient than marsh specialists to anthropogenic changes. This entry was posted in Algeria, North Africa and tagged Boussedra, breeding, clutch size, Common Moorhen, Gallinula chloropus, Lake Tonga, nest-site selection, Ramsar wetlands, wetlands. Bookmark the permalink.